OK, So I know I Can’t Have Regular Flour….What Should I Use? This is where things get a little tricky and people are still determining what works best. As I mentioned in another post, the gluten in wheat flour is what gives the bread that soft and fluffy texture. Many are working on ways to get decent gluten-free bread where the texture is at least similar to its wheat counterpart. I am not a big fan of the texture I’ve found in a lot of gluten-free breads – so I have eaten less bread. This works out great as I am on a mission to lose weight anyway! When just starting gluten-free, go ahead and buy the gluten-free all purpose flour blends you find in the store closest to you. I use them all the time and have great results. When making my own recipes, say for example banana bread, I use an even substitution – if my recipe calls for 2 cups of flour, I use 2 cups of the gluten-free all purpose flour. 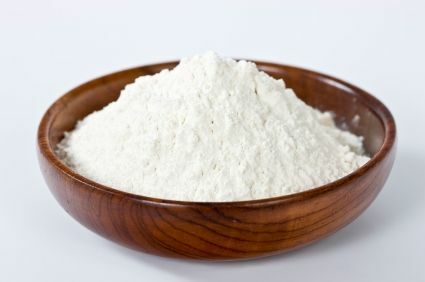 If I am baking something that needs a little “fluff” like a muffin or a cake, I have recently started to add a 1/2 teaspoon of xanthan gum, per cup of gluten-free flour. Xanthan gum gives the dough or batter a “stickiness” that gluten usually gives. In theory, this combined with the fat you use should make the final product “lighter” but be careful of adding too much…….you could have a sticky mess on your hands! You will probably need to experiment with this. Some mixes might contain xanthan gum or guar gum, so you might not need additional umpf. Some say you need as much as 1 teaspoon per cup of gluten-free flour. This is what I suggest: try it without adding any extras at first. See if you like the texture……then make adjustments the next time you make it. Be sure to write down what you did though so you don’t forget!! Using my banana bread as an example, if I am making actual loafs of banana bread I do not add any xanthan gum. I like for the loaf to be a bit heavier to hold up to butter or jelly. BUT if I am making banana bread muffins (same recipe, just in muffin form) I add it! More good news: If you don’t have your own recipes for pizza crust, muffin, bread, pancake, scone etc. most of these companies have their own specific mixes! If you have the time and the energy, you have MANY gluten-free substitution options for wheat flour and can make your own mixes. Successful mixes usually are made from several different flours for best results as some of them are better for thickening, some don’t mix well with dairy, some have better minerals and fiber etc. But here is an idea of other gluten-free flours available: Arrowroot, almond, amaranth, buckwheat, chestnut, chickpea, coconut, corn, fava bean, filbert, flaxseed, millet, peanut, potato, quinoa, rice, sorghum, soy, sweet potato, tapioca, teff, walnut and more. King Arthur has some of my fave mixes, not just GF bread but also their cakes and muffins. I like Chebe’s flatbread. Have you tried Udi’s, Rudi’s, or Canyon Bakehouse? All these products are in the freezer section usually. Yes, I usually toast it. I’ve also found GF Ciabatta rolls from Schar – they were good for Swchs but I toast them as well. I like to do seasoned oil/vinegar dressings on my sandwiches, so toasting helps. But those rolls are pretty good, as far as pre-made! Hmmm Schar…….I think that might be the other brand that I tried. I got it from Jewel, its in a sealed pkg. I think I saw the GF Ciabatta rolls there. THANKS! I will pick up some next time I am there. THANK you for sharing this recipe! It does look GREAT and I think I might have to find the time to try it out!